Crystals is an incredible mall opened in December 2009, in the whole City Center in Las Vegas and it’s the largest commercial structure that qualifies for the LEED Gold for the core and envelope. City Center is a complex urban district located in Las Vegas Strip, a collection of impressive residencies and hotels, casinos, halls, galleries and luxury trade. This high-modern megaproject represents a thematic park that brings together works of Pelli Clarke Pelli, Kohn Pedersen Fox, Helmut Jahn, Rafael Vinoly, Foster+ Partners, Studio Daniel Libeskind, Rockwell Group and Gensler, bringing to a new level the signature architecture. Looking at this sensational place, it’s very hard not to observe among hotels and residencies, a huge faceted glass skylight that play fairly fractured beauty of a quartz crystal named Crystals. This astonishing retail and entertainment place is more than 500,000 square feet of sophisticated retail, luxury galleries, gourmet restaurants, offices and administrative areas. 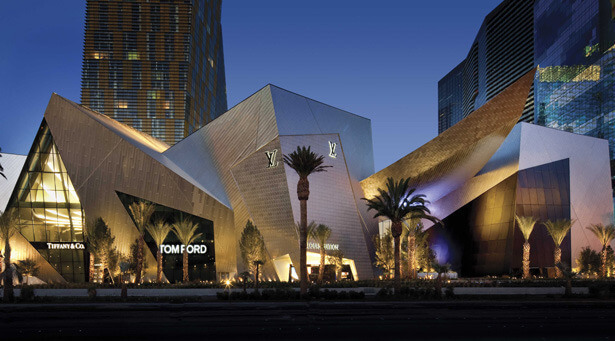 The mall’s architecture, designed by Studio Daniel Libeskind, reflects the already well-known style of the author. Its interior is a concept of David Rockfell and Rockfell Group, created on three levels with temporary works of art, a carpet of flowers and hanging abstract gardens. Crystals, like the entire district of City Center, was designed on sustainable features like water and energy economy. So the underfloor air conditioning system allows adjustment of thermal comfort based on occupancy of the various rooms. Interior also makes use of LED lighting and flueorescent tubes. Special attention was paid to the quality of materials used for interior and exterior design. Planning outdoor uses drought resistant plants and humidity sensors that trigger the irrigation system only when needed. To the one who blathered about opinion vs. fact, as if everybody agreed it was a problem, please consider this viewpoint. And about ten more from different angles. What in the world would most people do without the amazing thoughts you share on this site? Who else has the perseverance to deal with vital topics for the sake of common visitors like me? My partner and i and my guys are very blessed to have your web blog among the kinds we typically visit. We hope you know how very much we get pleasure from your effort! Best wishes coming from us all. It truly is rare to find a professional person in whom you will surely have some faith. In the world these days, nobody absolutely cares about showing others exactly how in this matter. How fortunate I am to have definitely found a really wonderful blog as this. It really is people like you that make a true difference nowadays through the strategies they talk about. The suggestions you discussed here are incredibly valuable. It absolutely was such an exciting surprise to see that awaiting me as i woke up now. They are often to the point as well as simple to interpret. Thanks for your time for the thoughtful ideas you’ve got shared here.